First Strike Electrical offers first class electrical services across London. Our fully qualified, professional electricians are on hand 24/7 and committed to providing an outstanding customer service every time. Established since 1999, we have built a strong reputation as one of London's top electrical firms, whatever the job. First Strike Electrical are your local and reliable electrical contractors. Established in 1999 we have since been providing top quality electrical services to both domestic and commercial customers. We have worked hard to build up our excellent reputation and are now proud to be one of London's leading and most trustworthy electrical companies. If you would like to hear more about what we can do for you, call us today on 0203 633 4536 or fill out our simple contact form. 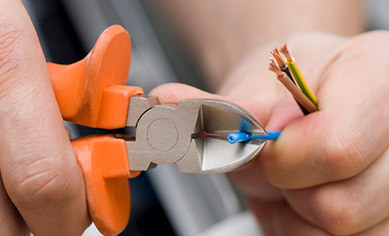 All of our electricians are City & Guild qualified and have years of experience in the industry. From small electrical installations to full rewiring contracts, our electrician team can carry out the work on-time at a competitive price. For more than a decade now, we have been offering an unmatched 24/7 Emergency Response service across the London area. If you need an electrician right away, give us a call now and we endeavour to have one of our experienced team members respond within an hour to fix your problem. At First Strike Electrical we take the safety of our customers very seriously. Whatever the size of the job, we follow IEE Wiring Regulations (BS 7671:2008) and will provide you with all the relevant certifications that you may need. For businesses, this ensures that you are kept compliant with all health & safety regulations, and at home it gives you the peace of mind you need. We also offer a personal guarantee for all jobs that we undertake, which you can read more about here.